We have been home educating Amelia since she turned five, and so a new chapter of St Edmundsbaby has appeared. 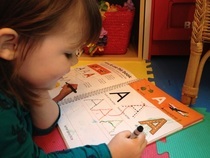 This will hopefully help me to see how she is progressing as she learns to read and write, but I hope it will be useful for others who take an interest in their child's education as I share some of our projects and resources. I recently hosted the first West Suffolk Home Education Fayre at the Apex, which was very successful. Watch this space for details of future events! I spend some of my week teaching Music - both privately at home, as a peripatetic music teacher in schools, and alongside Dancing Sparkes Academy teaching a group of home educated children. My main instruments are violin, piano and singing, but I like to have a go at everything! I currently have group sessions based at Fornham All Saints Community Centre and in West Stow Anglo-Saxon Village. The world is our classroom. Amelia and I spend so much time out in nature, and without even thinking about it, we are learning about all sorts of things including Biology, Geography, History, Maths, Physics, and a respect for nature and the world around us. We run Forest School sessions for families and home educated children called Nature Explorers, in partnership with Explore Outdoor, which is based at West Stow Anglo-Saxon Village. The Creative Education Centre is a creative Montessori based alternative to mainstream schooling. 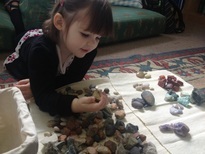 Set in an idyllic chapel in Fornham All Saints, the centre offers informal and personal learning for children aged 5-11 using Montessori teaching methods. They offer a relaxed, low pressure and creative approach to learning in a caring, small-scale and mixed age environment. There is an emphasis on the outdoors and natural environment. It is run by two very experienced and friendly teachers, and feels just like a family. Well worth a look.